I just completed my 9th cruise, five of which are the same itinerary, the 7-Day Mexican Riviera from the Long Beach port. I had never done a cruise until February 2014 and now I have completed nine with the tenth I anticipate being on the Carnival Panorama. I drove in from Scottsdale, AZ for this trip. I actually got to the cruise terminal a bit early so I wandered over to the Queen Mary and grabbed some breakfast. I try to always purchase the Faster to the Fun package so that I can take advantage of those benefits. The most important one to me is to be able to go straight to my cabin and dump off my stuff and then go to Lido Deck for some lunch. Embarkation was incredibly smooth. When they let us into the terminal, I honestly believe we were seated for only 45 minutes before they opened the doors to go aboard. I went straight to my Ocean Suite cabin, 7253, of course, the room was all ready. I dropped off my carry on luggage and went up to the Lido Deck. The first place I went to was the Ol&apos; Fashioned BBQ on deck 10 aft. This is a hidden gem. I have never seen a line at this spot and the food is great. I wandered around the ship to see what was new and what was happening. After a while we did the Safety Muster. I got to station A, but no one was really taking charge at the site and I never did get my Sail n Sign card scanned to show that I made it. The Muster only lasted about 15-20 minutes (woo hooooo). However later that evening, I got a letter stating I did not make it to the mandatory safety muster and that I should review the process of an emergency evacuation of the ship. 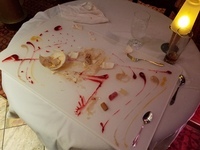 The first evening I ate in The Steakhouse restaurant. Carnival increased the price from $35 to $38 but it is still such a great bargain. 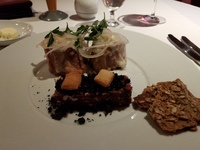 I started with the Bone Marrow and Hand-Cut Beef Tartare. I have never eaten either before but I make it a point to eat things I would never eat otherwise on the ship. Both were very good. I could not get enough of either. I have to admit I got the shrimp cocktail too. I just wanted a Plan B in case I did not like the other appetizer. For the main course, I got the Australian Wagyu. And for the dessert I got the Chocolate Sphere. I also did the wine pairing for this complete dinner. So I got some Layer Cake Pinot Noir with the Bone Marrow and Beef Tartare. I got some Oyster Bay Sauvignon Blanc with the shrimp cocktail, and Layer Cake Cabernet Sauvignon with the Wagyu, Lastly I got some Graham&apos;s Six Grapes Port with the Chocolate Sphere. The wine pairing was only $18 extra. Like I said, the bone marrow and the tartare was delicious. The shrimp cocktail was pretty good. (It&apos;s shrimp. What can you do to shrimp.) 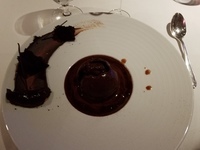 The Chocolate Sphere was absolutely fantastic. The restaurant is a MUST DO. It is $38 per person including gratuities. The first sea-day was pretty much as you might expect. Lots of trivia and shows. Plenty of entertainment choices for all. Cabo San Lucas was great. I did a day trip to a local resort and hung all day on the beach. In my opinion, one of the best sites to see at Cabo is found ONLY when you are tnedering in to or out of the piers. I love watching the sea lions hitching a ride on the back of the fishing boats begging for fish. In Mazatlan, I took the Hop-On Hop-Off bus tours. I got off at the Basilica of the Immaculate Conception and chatted with some of the volunteers. I went over to the market and it was pretty amazing. The next port was in Puerta Vallarta. I hired a cab to take me around the unusual sites in town. He drove me to where Elizabeth Taylor and Richard Burton lived, he showed me around the Romantic Zone of PV and then showed me an errant crocodile in the marina. This is the Bone Marrow and Beef Tartare. Chocolate Sphere. This starts with this large chocolate sphere in a bowl. I just completed my 9th cruise, five of which are the same itinerary, the 7-Day Mexican Riviera from the Long Beach port. I had never done a cruise until February 2014 and now I have completed nine with the tenth I anticipate being on the Carnival Panorama. I drove in from Scottsdale, AZ for this trip. I actually got to the cruise terminal a bit early so I wandered over to the Queen Mary and grabbed some breakfast. I try to always purchase the Faster to the Fun package so that I can take advantage of those benefits. The most important one to me is to be able to go straight to my cabin and dump off my stuff and then go to Lido Deck for some lunch. Embarkation was incredibly smooth. When they let us into the terminal, I honestly believe we were seated for only 45 minutes before they opened the doors to go aboard. I went straight to my Ocean Suite cabin, 7253, of course, the room was all ready. I dropped off my carry on luggage and went up to the Lido Deck. The first place I went to was the Ol&apos; Fashioned BBQ on deck 10 aft. This is a hidden gem. I have never seen a line at this spot and the food is great. I wandered around the ship to see what was new and what was happening. After a while we did the Safety Muster. I got to station A, but no one was really taking charge at the site and I never did get my Sail n Sign card scanned to show that I made it. The Muster only lasted about 15-20 minutes (woo hooooo). However later that evening, I got a letter stating I did not make it to the mandatory safety muster and that I should review the process of an emergency evacuation of the ship. 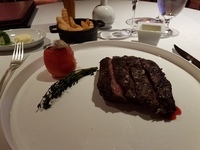 The first evening I ate in The Steakhouse restaurant. Carnival increased the price from $35 to $38 but it is still such a great bargain. I started with the Bone Marrow and Hand-Cut Beef Tartare. I have never eaten either before but I make it a point to eat things I would never eat otherwise on the ship. Both were very good. I could not get enough of either. I have to admit I got the shrimp cocktail too. I just wanted a Plan B in case I did not like the other appetizer. For the main course, I got the Australian Wagyu. And for the dessert I got the Chocolate Sphere. I also did the wine pairing for this complete dinner. So I got some Layer Cake Pinot Noir with the Bone Marrow and Beef Tartare. 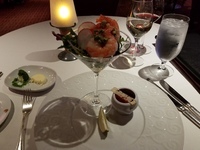 I got some Oyster Bay Sauvignon Blanc with the shrimp cocktail, and Layer Cake Cabernet Sauvignon with the Wagyu, Lastly I got some Graham&apos;s Six Grapes Port with the Chocolate Sphere. The wine pairing was only $18 extra. Like I said, the bone marrow and the tartare was delicious. The shrimp cocktail was pretty good. (It&apos;s shrimp. What can you do to shrimp.) The Chocolate Sphere was absolutely fantastic. The restaurant is a MUST DO. It is $38 per person including gratuities. The first sea-day was pretty much as you might expect. Lots of trivia and shows. Plenty of entertainment choices for all. Cabo San Lucas was great. I did a day trip to a local resort and hung all day on the beach. In my opinion, one of the best sites to see at Cabo is found ONLY when you are tnedering in to or out of the piers. I love watching the sea lions hitching a ride on the back of the fishing boats begging for fish. In Mazatlan, I took the Hop-On Hop-Off bus tours. I got off at the Basilica of the Immaculate Conception and chatted with some of the volunteers. I went over to the market and it was pretty amazing. The next port was in Puerta Vallarta. I hired a cab to take me around the unusual sites in town. He drove me to where Elizabeth Taylor and Richard Burton lived, he showed me around the Romantic Zone of PV and then showed me an errant crocodile in the marina. This is a fine suite. The only thing that was wrong for me was the air conditioning. It did not work. But by the time we made it to the ocean I actually didn&apos;t need any air conditioning anyway. As an Ocean Suite, the accommodations were a little larger than the typical cabin. My bathroom had a shower/tub combination with water jets. But I am a husky boy so I really could not fit into it to take in a hot tub experience. I did the Hop-On Hop-off bus tour. I got a big sunburn in Mazatlan so I strolled across the street to the WalMart and bought sunscreen lotion. Too Late! I then hired a cab to take me around town for two hours..